Hooked Rug Storytelling: The Art of Heather Ritchie by Lesley Mary Close, featuring various 'memory' rugs created by Heather, was published by Schiffer in the USA on the 22nd April 2011. Copies are available from the UK distributor, Gazelle Book Services. Heather brings her own unique style to this traditional craft. Her work has been mentioned in several British and North American publications but this is the first book to tell the story of her life and work. Heather's approach to rug-making has transformed a basic handicraft into an art form of great subtlety, and the stories told in this book relate to over twenty of her rugs. 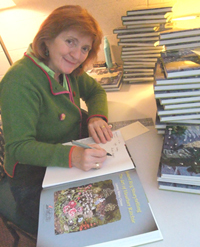 She shares anecdotes about Scarcote, the North Yorkshire farm where she spent many happy childhood holidays; Guiding Light tells how she would walk with her newly-blind father when she was only five years old, helping him form a mental map of his home town; Paradise Garden, based on the last photo of her mother in the garden amongst beautiful flowers; and Origins and Identity, which ends the book with details of Heather’s work in The Gambia teaching blind people to make rugs. The book explains how Heather created each rug and provides a valuable insight into her techniques. It is illustrated with many photographs of the rugs, whole and in detail, as well as the ‘source material’ which inspired them. "The book is simply splendid! You must be so pleased. I hope it becomes a best seller! It is wonderful, wonderful"
"I can easily say that it is by far the best rug making book that I have ever seen"
"I must again compliment you on your new book. I believe we can say that it is simply EXCELLENT"